You may use this symbol of an underwater-animal to meditate or reflect on your innermost values and desired contributions. Find your personal and unique puzzle piece to be(come) a co-creator for the planet. Humanity is on the verge of its greatest evolution yet. The whole universe awaits y-our decisive steps to unity. The holy books captured in one sentence: Love the others, as you love yourself . - The 'Sacred Secret' in two words: Free-Willed Divine. - In three sentences: Humanity is an experiment of the highest Divine to surpass Itself. S/He created a being that had temporarily to forget its divine origin and leave the Paradise, but one distant day will remember, and out of free will be-come Divine again. This precedes the next step of Evolution called (by Sri Aurobindo) the Supramental. (May 2015) Are the two main forces of the universes MAgnetical and GRAVitational fields? hence all periodic elements are inter-changeable. This opens a science that is nothing short of r-evolutionary. Exploration of space is now possible, because there is no need to transport anything. Other planets and galaxies can be reached in an instant, by 'matching' their Magrav field. Water is created on the spot, as well as food, and any material needs. Illness can be cured by first understanding its cause, and then balancing its appearance. is dissolved and restored to its pristine origin by the same principles. A year-long experiment to clean up Fukushima in 2014 is ready to be scaled. See this 45 min video. was wisely patented by MT Keshe in 2005/06 and then donated to humanity. 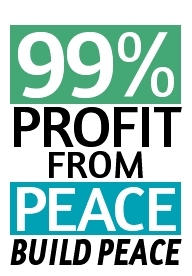 With the explicit aim to end exploitation and if necessary enforcing world peace. or can be made inexpensively at home with a few instructions and a little caution. And this was just the beginning. A pain pad relieving inflammatory pain has been developped. A series of breakthrough adaptations are in the making. Based now near Bari (Italy) and in Ghana, education via live workshops has continued. next to a series of other recordings are freely available at livestream.com or via the KF website. another one was on Easter Saturday 30 March 2013.
organised in the 12 sectors of Barbara Marx Hubbard's 'Wheel of Co-Creation' - see below. 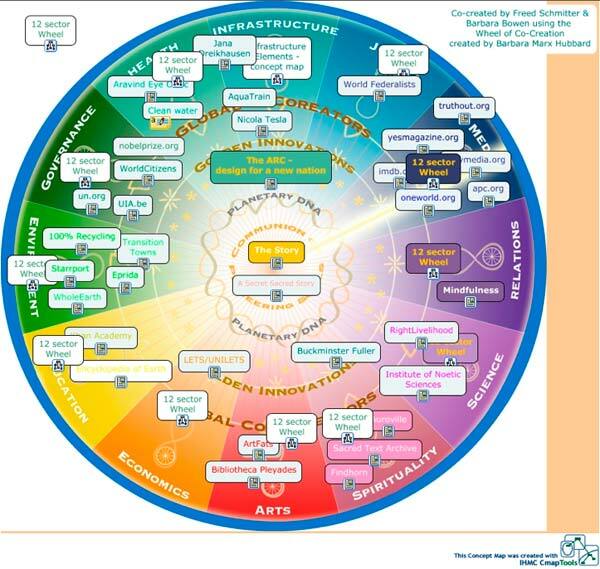 Project: Wheel of Co-Creation by Barbara Marx Hubbard, with 12 sectors. (example here: sector Infrastructure. Meant to be holographic and interactive in its next stage). The beauty of this model is that activities and passions are categorized in 12 all-encompassing fields. These 12 spheres (plus a central hub) can appear as color dots e.g. on visit cards or name tags. Targeting contacts in conferences, meetings, working groups will then be greatly facilitated. On Internet, a landing page allows to present global as well (a few layers deeper) local activities. A smart systemic approach will be used to let everyone participate in building worldwide. Golden Innovations for each sector serve as inspiration and highlight solutions to present challenges. by the former Palestinian activist / entrepreneur Bashar al-Masri. Planned to be ready in 2013. Image by Bayti. The Dutch television VPRO / TEGENLICHT presented a documentary (in Dutch) on Rawabi in October 2012. To explore how this process works, it is adapted occasionally to recent worldnews. Visit our sister website http://recyclus.com with proposal for an environmentally-friendly (-ier) airport design by the American inventor Jim Starry, with links to a 12 page article in WorldWatch Magazine of July/Aug 2001 and USA Today article in Jan. 2004 / Dec 2006 on Starrport. Reports from Conferences on Aviation and Environment. A major airport can save 1 billion liter fuel per year by smart design and advanced technologies. Personal Reports: May 2000 UN Millennium Forum, - Sep 2000 State of the World Forum, etc. still actual: 11 September 2001 - 9-11: Will Humanity Pass the Test? / Is UNITY the Key? - Millennium Forum, Treaty of Noordwijk, etc. 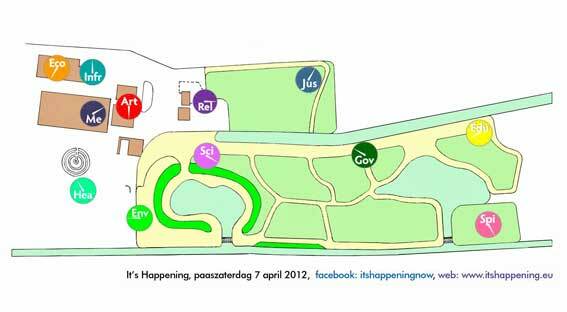 - Kernwapens, Haagse Vredesconferentie, etc. This site is dedicated to find or share new transformative thoughts, projects and events to reveal long-due human unity. It attempts to signalize, analyze and comment on powerful potentials, possibilities and phenomenons. - Planetwork.org is dedicated to empower a magically comprehensive and joyous daily reality for the 3rd Millennium that benefits the many instead of the few. - The human body consists of billions of cells, all miraculously designed to work together. Likewise, the 7.6 billion stewards of planet Earth are challenged to ever-more contribute, co-operate and co-create.